Jackie and I went to the University of Illinois Meat Sales Room, aka the Meat Lab, to buy eggs. On the way in, I noticed a sign on the window saying that they had fresh chickens available for $1.75/lb. 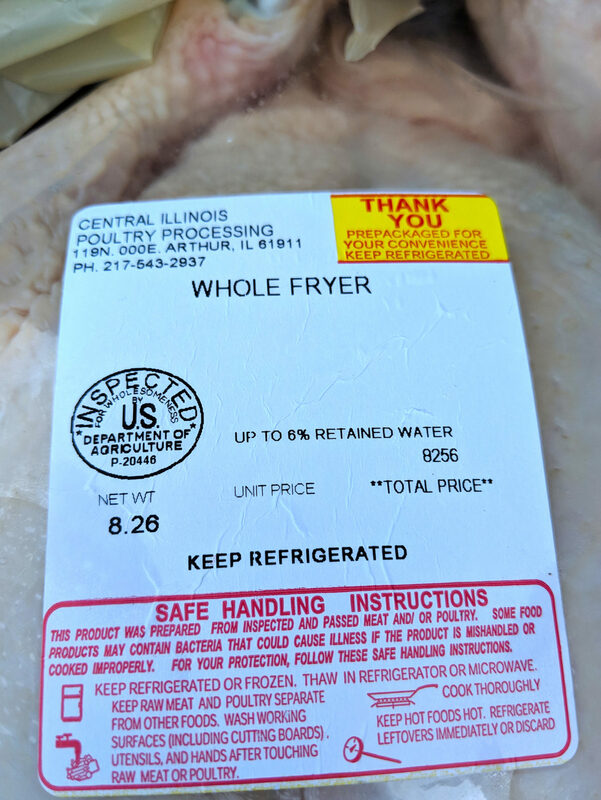 I had just been saying on twitter that, with USDA changing the rules to allow chicken to be shipped to China to be cut up into pieces and then shipped back to the U.S. and sold as “Product of USA” with no further inspection, it was perhaps time to just switch to only eating local chickens. These chickens, produced by the university’s agriculture department as part of their educational mission, certainly qualify—the Poultry Research Farm is only about 2 miles away from our house. So, once we got in line with our eggs, I told the woman at the fresh case that I wanted one chicken. And I got one. Basically, it’s the size of a small turkey. I have never seen a chicken this size. It outweighs the next biggest chicken I’ve ever bought by a solid 50%. Jackie has undertaken to cook this enormous chicken, which will no doubt provide leftovers for days. People have almost certainly been cooking with lard since the domestication of pigs close to 10,000 years ago. Along with butter and olive oil, lard must be one of the oldest “processed foods” around. When I was writing my post on whether or not saturated fats would kill us all, I discovered that “grocery store” lard is often bleached (bad) and often partially hydrogenated (terrible). So it occurred to me that I probably ought to try to get some less-processed lard. I asked at a local butcher, but they said they didn’t sell lard. Then I asked at the University of Illinois Meat Lab, which said that they didn’t make lard, but that they could set aside some pig fat for me, if I wanted. Due to the room being a bit noisy, I hadn’t quite heard what they said, and had thought that I would be getting lard. But no: I got a couple of pounds of vacuum-packed frozen pig fat. But that was okay. I read a couple of web pages on how to make lard, and went ahead and rendered it myself. They had given me nice clean fat—just a modest amount of blood and connective tissue remained attached. I let it mostly thaw, cut it up into quarter-inch cubes, put it in a heavy pot with just a little water, got it just hot enough to simmer, and let it just barely simmer for a couple of hours so that the fat melted away from the connective tissue. Then I ladled it all through some cheese cloth and a colander (which kept the “cracklings,” i.e. lightly fried connective tissue, and let the melted lard drain through). 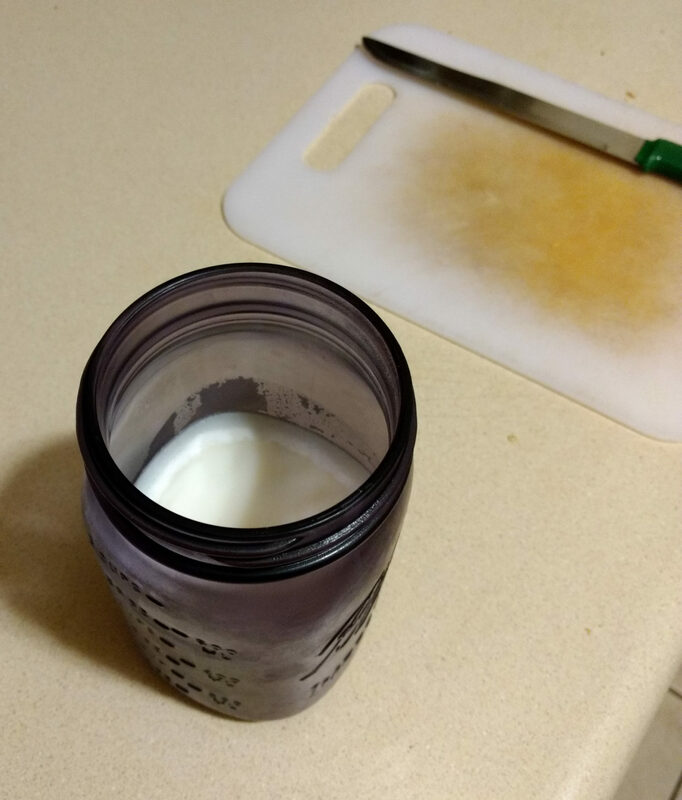 I poured the melted lard into a mason jar, let it cool, and popped it into the fridge. I don’t use much lard—mostly I just use it to touch up the seasoning on my cast-iron cookware, very occasionally to cook something where I don’t want a butter or olive flavor—so I expect this will last me a year or more. It was easy enough to do that I don’t think I’ll hesitate to render my own lard again when I run out. As long as I was rendering fat I went ahead and re-rendered some beef tallow that I’d skimmed off the top of the sauce for a pot roast that I made a couple of weeks ago. I just melted it, cooked it long enough to boil off the watery bits, and then poured it through a strainer to get the bits of rosemary leaves and mushrooms that had clung to it when I skimmed it. It’s kind of odd tallow, because it still has plenty of rosemary and mushroom flavor, and is red because of the tomato paste in the pot roast sauce, but it makes a fine fat for sauteing veggies, cooking omelettes, etc.